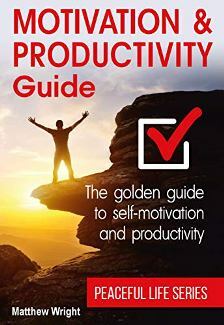 Motivation and Productivity Guide book discusses the relationship between motivation and productivity. "There is no productivity without proper motivation." Do you lack motivation and have no energy to accomplish anything despite so much of what is waiting for you? Matthew Wright's Golden guide to self-motivation and productivity reveals happiness as a key to having great productivity. With blunt honesty acting as a major tool in the production of this life changing book. Wright reveals more than enough ways to "Be your own champion" with amazing story references made. One would be amazed at how far the right motivation can yield unexpected results to get us our set goals.